Merle Wood & Associates is pleased to have the REBECA yacht for sale. At 110’ (33.5m), she accommodates 8 guests in 4 elegant staterooms, while a crew of 4 ensures top-notch service. Her large master stateroom features his-and-hers en suites that are connected by a large rain-head shower area bathed in granite walls and flooring. Full-height windows to port and starboard in the guest staterooms create an open feel, and each has its own en suite and entertainment system. The REBECA yacht for sale was previously bought by her owner through Merle Wood & Associates, and is again in our trusted hands. As the 3rd hull in the successful Horizon P110 tri-deck series, the REBECA yacht for sale will offer its new owner a modern interior with neutral tones and rich wood throughout. Her main salon features off-white soft furnishings and carpet, with hardwood flooring forward in the dining area. Large windows grace the entire deck, giving a very open feel to the space. A flat screen television is highlighted by the surround sound that gives a more balanced audio experience to her entertainment system. Stairs in the dining area lead up to the bridge deck, which offers a modern bridge featuring state-of-the-art navigation and communication systems and a casual al fresco dining area aft. The REBECA yacht for sale has a generous hydraulic swim platform and exterior deck spaces, as well as reliable, GRP construction. With plenty of space for outdoor dining, the aft deck features hardtop shading, a waterproof outdoor TV, and plenty of built-in and loose seating with a dining table. Up top, the flybridge deck includes a Jacuzzi, a grill and built-in seating. REBECA is also equipped with a dive compressor. Twin 1,900hp Caterpillar engines give her a top speed of 20 knots, while cruising is at 16 knots. For added comfort, she is equipped with ABT zero-speed stabilizers. REBECA has low original hours and a platinum warranty on her engines through 2020. With over 15 years of experience in high-end luxury markets worldwide, and over a decade in yachting, John Jacobi has successfully built yachts on three continents for a wide array of global clientele. As a luxury yacht broker for Merle Wood & Associates, he is highly focused on the needs of clients for the purchase, charter, building and selling of yachts worldwide. For additional information, read the full REBECA yacht specs or view the REBECA yacht price and details. 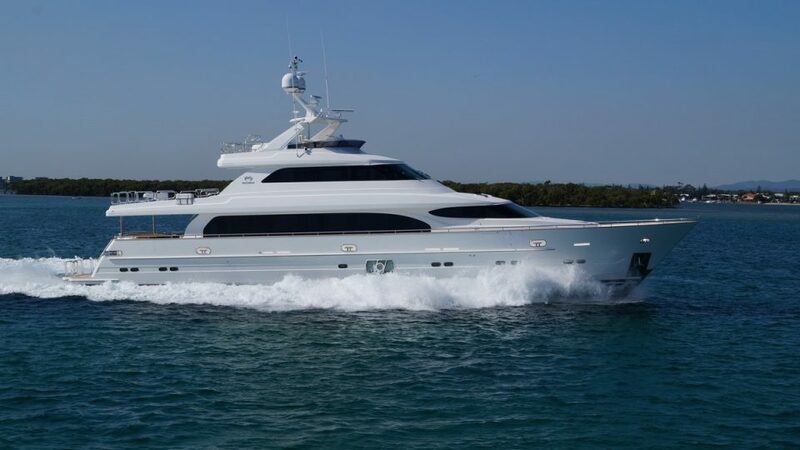 For information about the REBECA yacht for sale, or for expert knowledge from a qualified yacht broker, simply contact the luxury yacht brokerage firm of Merle Wood & Associates for assistance.